We would love to hear any questions or comments you may have. Simply fill out the form below and someone from Jerome's General Contractor will contact you shortly. 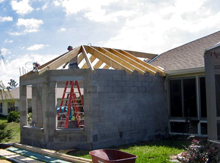 At Jerome’s General Contractor, Inc., the goal of our company is to provide you with the highest quality product and service at a competitive price. So if you are considering new construction, an addition or conversion of an existing structure, renovation, or aluminum structure or birdcage, take time out to view our site and see what we will do to help make your dreams come true.